Happiness is a lifelong pursuit. But once in a while, you have an experience that makes you ask yourself, what is it that you are really pursuing? What really makes us happy? Is it having a lot of money? Is it being with someone you love? Is it doing a job you love? I don’t really know. Maybe it’s none of the above. Maybe it’s all. Maybe it’s sheer contentment. But my trip to Bhutan really made me think about it. I’ve honestly not met nicer people than I did here. People who would go out of their way to help us (my friends and I), without any expectation of receiving something in return. It seems like such a small thing, but it’s rare to find such selfless generosity. Especially in a world where networking or making friends for personal gain is oft the norm. Almost every person I met there was just so happy; so content with their lives. They’d smile at you walking by on the streets; offer to help you if you appeared to be lost. They weren’t blinded by ambition, chasing after a big cabin or a promotion. They weren’t compromising on their health just to make a lot of money. They weren’t bothered about materialistic items either. Not because they couldn’t acquire them, but because they really didn’t want to. They seemed to have the innocence of a child; untainted by the evils of the world. An innocence that didn’t appear to easily fade. One of the most humbling experiences I had was with Rinzin and Ugyen; two young Bhutanese girls who was working as a staff member of Hotel Singye. 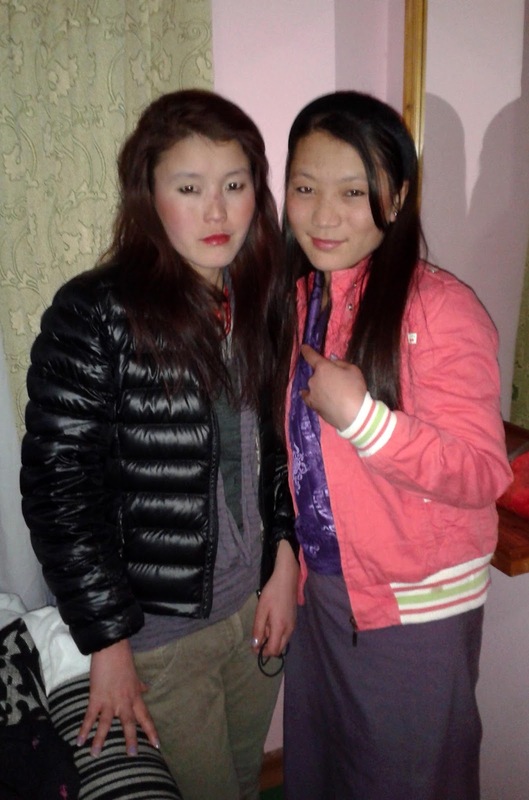 We began chatting with them the day we arrived asking about things to do in Thimphu. They were so jovial with bright, welcoming smiles; enthusiastically telling us about their city. They told us that karaoke is big here and there are many places around our hotel that hold karaoke nights. More so, they offered to take us there with their friends who already planned on going the next night. So we got dressed up—basically in layers of sweaters since it was nearing -8 degrees that night—and joined her group late one evening. They led us to an underground club called Ama's Downstairs Lounge buzzing with people belting out popular Bollywood numbers and soulful Bhutanese melodies. Rinzin and Ugyen were singing along with her friends while translating from Bhutanese to English, urging us to dance to the tunes. It was a great evening. When it came time to pay for the drinks we ordered, Rinzin jumped up and took it from us. All these young 20-year-olds whom we barely knew, were offering to pay for us. I was so overwhelmed at their gesture. Not many people do that; let alone complete strangers who were earning their wages at a hotel. I didn’t let them pay, but just that they treated us like their friends was so humbling. Another act of kindness was displayed when we met Karma at a restaurant in Paro. We were kind of lost so we asked her for directions. It stirred a conversation that led to my friend sharing that it was her birthday the next day. When we met her again later in the evening, she actually bought my friend a birthday gift. We couldn’t believe it. We had just met her, mentioning the birthday in passing, and she went and got a gift. An unexpected gesture that left us speechless. I remember reading Pico Iyer’s book Falling Off The Map, where in his chapter on Bhutan, he ponders whether this kindness arose from wariness of keeping foreigners at a distance. After all, the Bhutanese are very careful about the number of people they welcome into their world. While us Indians can simply procure a permit to enter the country, foreigners from other nations have to cough up $200-$250 a day to visit Bhutan. This is probably the reason why Bhutan is so well kept. You won’t see beggars on the roads, derelict buildings or even excessive crowds of people. It’s possible the government shields people from knowing what is outside their borders, thus preventing them from wanting things they don’t have. Bhutan was the last nation in the world to have television; even the Internet arrived in 1999. But maybe the Bhutanese don’t want to be exposed to the rest of the world. Maybe living in a remote oblivion is why they are happy. After all, ignorance is bliss. What you don’t know can’t hurt you, can it? There are no clear answers, but all I can say is the Bhutanese can teach us valuable lessons in letting go our expectations of life and living in peace and contentment.